As parents of children involved in Playtime Productions (theater for and by children), Ms Geranium and I have done an awful lot of driving kids to and from rehearsals and performances. Today, while driving my daughter and another child to rehearsal, I began to wonder how much driving that has been. By the end of this season's play (The Princess and the Pea, which opens sometime in March), taking into consideration that we usually have had a carpool made up of families in the neighborhood, I concluded that, over the course of the thirteen plays in which our kids have been involved (so far), we will have made an estimated 455 trips to the Monona Public Library where rehearsals are held. At ten miles round trip, that comes out to 4,550 miles driving kids to rehearsals and back. And I estimated on the low side for the number of trips taken. Nor did I include the miles driven from the library to performances. They do performances all over the county and each family is asked to drive a carload of kids to a performance three times during the run of each play and many parents, us included, go to more than three. Uff da! Yesterday, on the way to picking up after rehearsal, the sun was setting over the Lake Monona (for anyone not familiar with Madison, some would say it is nestled between two lakes, Monona and Mendota. I tend to think of it as mashed between two lakes.) 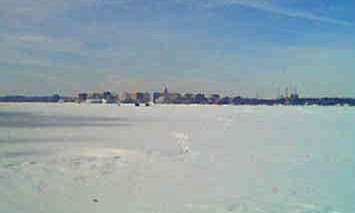 Downtown Madison was visible across the lake. I hopped out of the car and, thanks to the miracle of the camera phone, snapped this picture. 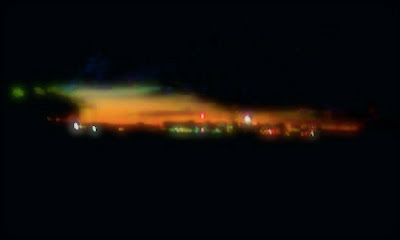 Then, today, on the way home from drop off, I stopped at the same spot and got a daylight shot. 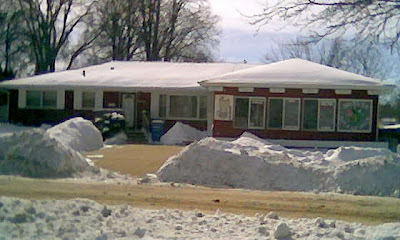 Some ice fishing shanties are barely visible - a familiar sight in Wisconsin winters. I've also noticed an interesting theme on the drive there and back: bait. Unfortunately, the sign is unreadable in this photo, but here is the Monona Ice Cream and Bait shop (would you like leeches on your sundae?) It's closed for the season, which I find puzzling, since it's right across the street from a park on the lake and ice fishing is quite popular in the area, although I've never tried it myself. 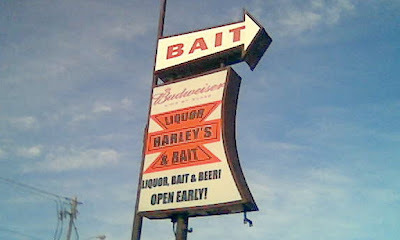 Not far away, we find Harley's Liquor and Bait Shop. Harley's is not closed for the season. This time of year, it's quite normal to see men dressed in serious winter garb (often their outfits are camouflaged - I wonder if that makes it harder for the fish to see them through the ice) stopping in to pick up some worms, leeches and blackberry brandy on their way out to do some fish huntin'. Oops, not statistics about Madison. About Wisconsin I meant. Although, I don't know about you, but to me the vehicle in this photo looks a lot like a front end loader and, furthermore, it looks very much earthbound. Maybe I haven't had enough to drink. That's an interesting segue - from bait and blackberry brandy to UFOs. Uff da. By the way, the link didn't work. I'll just have to check it out the manual way.